I'm older than that thing? Sheesh. Yeah, I'm older than a Rubik's Cube too. . . I actually remember when they came out and everyone on the bus trying to solve it. . . Man I'm old! I gave you an award on my blog. Check it out! How I hated those things! My boys could do them, I never could. Grrrr! The cube is making a comeback. My gifted first graders love that thing. The best I could ever do was 2 sides. That's not for lack of trying. We got one for my son a few years ago. Now I'm off to go find the thing. I just found your blog and I can't quit reading it! :) I love the 80s! Come on over and check out my blog when you get a chance. I'm having a cool giveaway right now, too! Nothing makes me feel quite as stupid as a Rubik's Cube. Still I try. One day I shall figure it out. I join the club of Rubik's Cube Haters and the club of those who hate those who can figure out the Rubik's Cube. Damn them! I love the Rubik's cube. I remember when I found my dad's and I would sit for hours on end playing with it. My brother had probably every single Rubik puzzle that was out there. I have never once solved it. I think the closest I came was solving one side. I don't think that I could ever solve this thing. My brother might have- or did he just peel the stickers off and put them back on to make it seem like he did. We had the Missing Link and the Pyramid too. Also, my husband doesn't read my blog either. I also learned that there's actually a braille rubik's cube. No joke. FYI...I was able to complete a side in 22 minutes when I was a mere 14 years of age. Beat that blogosphere. Are you kiddin' me?! The Rubik's cube was like WOW!!!! One of my favorite mind-bogglers! I was 16 or 17 when I got my first one (shaddup) and it took me about a month to figure it out....but figure it out, I did. I was able to solve the darn thing in about five minutes. Take that, Copyboy ;) Yeah, I know - brag, brag, brag. If it makes you feel any better - a couple of years ago, I decided I really missed my cube and wanted another one. My daughter bought it for me as a gift...and I sat there ready to peel the stickers off it when I couldn't remember, after a week of trying, how to figure the damned thing out. So, solving a cube is not like riding a bicycle. Just sayin'. The only way I was able to solve it was to peel off all the stickers, and then stick them back on the correct way. 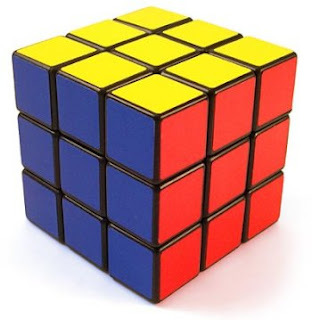 Aaaaaand I am older than the Rubik's Cube. I had no idea. I was never able to solve that damn thing, but I, too, cheated by removing the stickers. My mom totally knew I was a liar because they would be all dog-eared at the edges. This has nothing to do with your post, but I just saw the news that Gary Coleman died. Talk about a show from my childhood! The one thing that I always felt good about was that Rubik's cube was older than me...but now I learn it's not. so, did you ever figure it out?